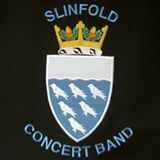 The choir of St Mary's Church come together with Slinfold Concert Band to perform a variety of music for everyone to enjoy. Tickets are £10 for adults and £1 for children and are available from St Mary's Office and on the door. There will be refreshments available during the interval.